Curls can be added to short or long hair. 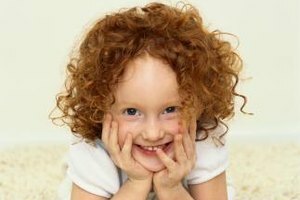 If your cheerful little girl desires Shirley Temple curls, don't despair. You can achieve perfect curls by simply using sponge curlers or bobby pins. While hot rollers and curling irons can deliver these lively curls, the heat can be damaging to the hair and uncomfortable to withstand -- as well as dangerous if your little girl is bouncy herself. A better option is to set her hair with heat-less, sponge curlers or bobby pins that, when released, give your little girl bounce in her hair and a spring in her step. Brush or comb the hair so it's free of tangles. Starting at the forehead in the center, create a 2-inch-wide section of hair, comb it straight up and spray with hairspray. Place a sponge roller at the end of the section of hair and roll backward to the scalp. Make sure it's taut but not so tight as to hurt the little girl. If the hair extends past the roller, you've grabbed too much. Lessen the thickness of each section, which will simply add a couple more curlers. Take another 2-inch-wide section of hair directly behind the first curler. Spray with hairspray and roll the hair into a curler. Continue placing curlers in a line along the middle of the head until you arrive at the nape of the neck. Grab a 2-inch-wide section of hair near the front left hair line, comb the hair straight down and spray it with hairspray. Place a sponge roller at the end of hair. Roll the curler up and under until you reach the scalp. This create curls that are perpendicular to the floor. Repeat this sectioning, spraying and rolling motion throughout the left section until you reach the back middle where the first section of curlers sit. Start at the hairline on the right side and curl the first 2-inch-wide section. Repeat this spraying and rolling motion all the way around right side of the head until the curlers meet at middle in the back of her head. Take any hair that may be left over beneath the side sections and separate it into 2-inch-wide sections and spray and curl the sections as you did the sections of hair on the side of the head, up and under until you reach the back of the head. All of the hair on the head should now be in curlers. Wait at least an hour -- preferably overnight if time permits and the little girl can sleep comfortably in the rollers. Unroll hair carefully without tugging or pulling and arrange the curls using your fingers or gently brush curls into the desired style. Spray the entire head with hairspray. Wash and throughly towel dry hair before the girl goes to bed. You can also dry the hair with a hair dryer until the hair is barely damp. Add a curling mousse or curl-enhancing balm to the entire head and brush through. Section the hair horizontally in half, twist up the top half and secure with a clip. Section the remaining hair again horizontally in half and clip. You should now have two sections clipped and one section loose. Brush the loose hair and section it into quarters. For thick hair, you may need more sections. Take a 2-inch-wide section and roll the hair, using your fingers, up the from the tips to the roots until you arrive at the scalp. Create a little bun and secure with criss-crossed bobby pins. Continue this across the head until you have four -- or more -- little buns across the nape of the little girl's neck. Unclip the middle section. Separate the hair into 2-inch-wide sections and repeat, rolling the hair to the scalp until all the hair in this section is secured with criss-crossed bobby pins. Release the clip on the top section closest to the forehead and grab a 1/2-inch-wide section of hair. Roll the hair from the tips to the roots until you reach the scalp. Again, criss-cross bobby pins in the center of each little bun. Repeat until all the hair around the crown and forehead is rolled up and pinned. Spray the girl's entire head with hairspray before going to bed. This helps keep the hair intact while sleeping and aids in defining the curls. Wrap her head in a scarf to keep the pins and hair secure. Take the pins out in the morning, unroll the buns and style the hair with your fingers. Add more hairspray and decorative hair embellishments if desired. Hold hairspray 8 to 10 inches away when spraying and use in a well-ventilated area. Take great care not to spray hairspray into the girl's eyes.